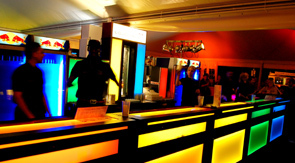 Europride, Zeitgeist, Cannes Lyons,Google and Saatchi together with the UK & Europe’s hottest mobile bar service. After taking the South African market by storm, LiquidChefs has continued to take its premium mobile bar service into the UK & European market. 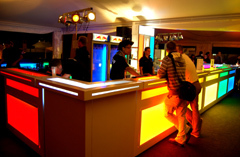 The summer of 2009 has seen LiquidChefs provide stylish bar staff and service to some of London’s & Europe’s most talked-about events. First off, the mother of all European gay pride festivals, Europride, which took place on the streets of Zurich and was flocked to by party people from all over the world. LiquidChefs was proud, excuse the pun, to be able to be part of such a signature party. Thanks to the compass group, Zurich was abuzz with talk of the incredible cocktails being served up by the 21 hot bar staff from the fabulous 21m evolution bar. Next up, The Grove Hotel, in Hertdforshire, just outside London played host to Zeitgeist. This is Google’s annual UK-based conference and arguably one of the best forward-thinking corporate events in the world. In keeping with the South American theme, LiquidChefs went the extra mile and created bespoke Latin cocktails using ingredients from South America. As a result, the event was deemed a caliente success for all involved. Google also celebrated the culmination and winners’ announcement of their competition to find new artists, photographers and designers who would contribute to Google’s iGoogle themes. 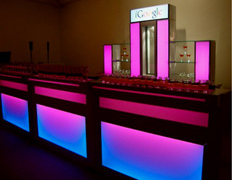 The event was held at the celebrated Saatchi Gallery in London and was staffed by seven of LiquidChefs’ best. The advertising, marketing and media industry’s most prestigious awards ceremony, the Lyons, was held from 21-27 June in Cannes in the South of France. One of the main features at the awards this year was the exhibition hosted by Youtube. The brief was to provide healthy smoothies to all in attendance. The bar was consistently busy and served up the healthiest of smoothies created using locally grown ingredients like Goji Berries, wheatgrass, guarana and carob root. These were blended with watermelon, basil, ginger and macadamia nuts, another innovative twist from the LiquidChefs team. LiquidChefs London opened in Aug 2008 as an international franchise. 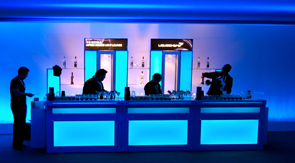 Whilst they primarily service the London region, they also frequently service premium events in and around Europe. LiquidChefs are continuously looking for investors and operators for other international destinations. For more information on the LiquidChefs business opportunity, contact Shai Evian on shai@liquidchefs.co.za or 011 8874535.